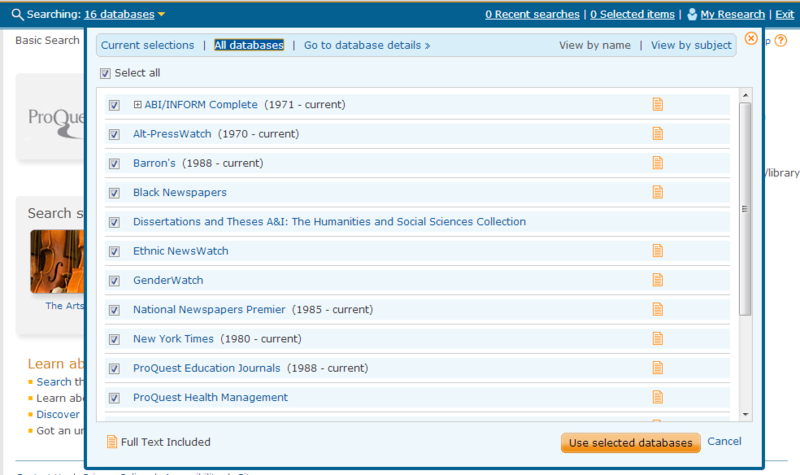 Scroll down to Proquest Databases and click it. Enter your college login and password if you're asked to. At the top of the ProQuest page, When you first log into ProQuest, you will see a blue stripe across the top. Click Searching __ databases select databases from the list. 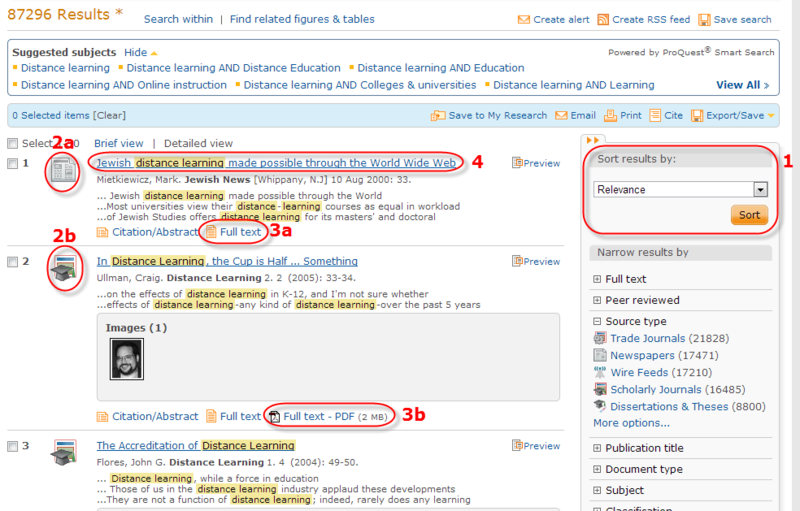 When you log in using the ProQuest databases link, you are automatically searching all the ProQuest databases. You can also search any one of the ProQuest databases individually by clicking its name either in Article Databases or in one of the subject guides. 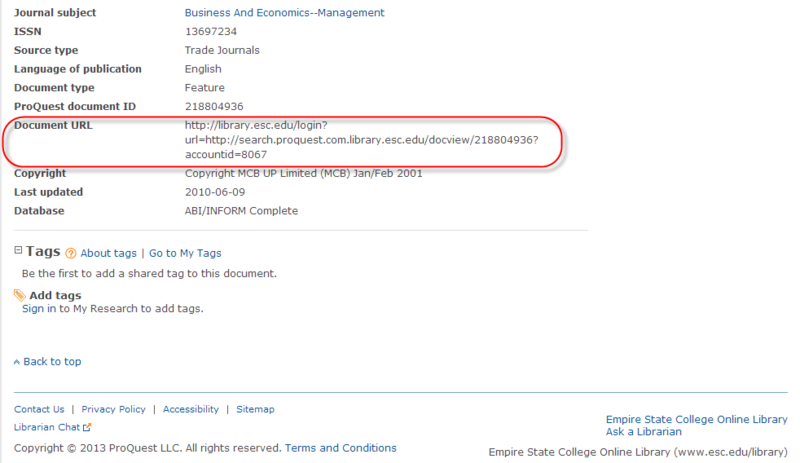 The Basic Search box is on the page you get to as soon as you log into ProQuest. only peer reviewed (a.k.a. scholarly) articles. To get to Advanced Search, click the Advanced menu item above the Basic Search box and select Advanced Search. Each of the three search boxes has a pull-down menu to the right of it. All fields + text (the default) - this is the same as a keyword search in Basic Search. All fields no text - searches the title, author, and abstract of the article. SU - subject headings, a.k.a. controlled vocabulary. The All Dates pull-down menu lets you limit your search to documents that were published within a certain date range. If you have the name of a person or place, enter it in the Person or Location search box. You can click Look Up People or Look Up Locations to browse through a list for the person or place you want. At the top of the column to the right of your search results is the Sort Results By pull-down menu. Unlike most databases, it is set to "Relevance" by default, which means that the search results at the top of the list are the ones that most closely match your keywords. You can change it to "Oldest first" or "Newest first". Your search results page displays 50 search results at a time. To see more, there are page numbers and arrows at the bottom of the page. Click on the article title to access the Article Information page. Full-text (gets rid of search results that aren't in full-text in this database). Think twice before using this option because it's very easy to find out if the full-text is available in another database. More on that later! At the bottom of the column, click Enter a specific date range to narrow your search results down to documents published within a certain date range. Email, Print, and Save/Export icons let you keep a copy of the article. The full-text of the article is available in HTML (web page) format right on the Article Information page. If there is no full-text available in Proquest, click the Check Full-text Availability link to see if it is available in another database. A permalink, which you need to use if you want to save the link to come back to the article, or share the article with someone else. 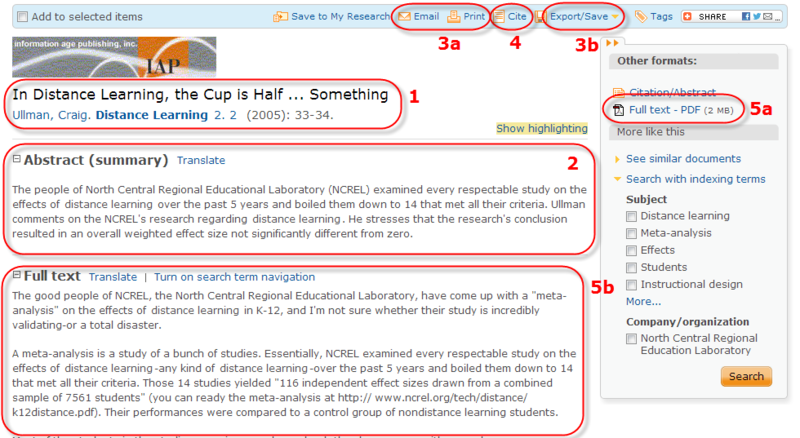 In ProQuest, the permalink is available to copy and paste at the bottom of the Article Information page. For more information about that, see How To Create a Permalink to an Article in a Library Database.